Great location in the middle of downtown Copenhagen close to Nyhavn, Amalienborg Castle, The Citadel and The Royal Gardens. Sofa bed in the living room. From this location, you can walk to the Royal Theater, Amalienborg Palace, Nyhavn and Strøget. This location is the entryway to all of Copenhagen. If you want to experience Copenhagen and walk around the city, this is the perfect location. The downtown area is the heart of Copenhagen. This is where you will find the pedestrian street Strøget, Copenhagens shopping Mecca. The downtown area also has numerous museums and historical points of interest. Particularly The Round Tower, The Stock Exchange, Christiansborg and Nyhavn are worth a visit. If you want to relax like a Copenhagener, enjoy a cup of coffee in the old Latin Quarter, locally known as "pisserenden" (Piss Gutter). The Latin Quarter has a number of trendy shops and pleasant cafés such as Robert's Coffee. You can also pay a visit at Tivoli, Copenhagen's amusement park, built in 1843. Tivoli is right in the middle of downtown and is a must for children of all ages. There are also a number of gourmet restaurants in Tivoli, such as Nimb. If you like markets and gastronomy, try out Copenhagen's market halls. They are a stone's throw from Nørreport station och carry everything from fresh fish, fruit and vegetables to gourmet chocolate and delicacies. If you need a breather, you'll find The Botanical Gardens a good place to unwind. Lovely apartment with room for 2 people. Hall, combined living room / dining room that leads directly into the kitchen. Combined toilet / bathroom, bedroom with 2 single beds. WiFi, TV and DVD (TV kan only be used to watch DVDs, since there is no station package), access to the building's common laundromat and drying room where you can inexpensively wash clothes. The apartment is on the 2nd floor in a building with an elevator. Bed room with 2 single beds, 90 x 200 cm each. Wonderful location, easy walk to anywhere. Kitchen good for cooking, shower good. Bedroom ok, though I always have jet lag, and was not prepared for long hours of light. I would return and do recommend to others. The Appartement was well-located. The beds were comfortable and the rooms were clean. We enjoyed our visit very much. Nice, quiet apartment. Very close to an A1 stop which will bring you to almost all of the tourist attractions. Several good restaurants in the neighborhood, including Cave Restaurant, El Viejo, and Michelin-rated Krokkeriet. Also close walking distance to grocerie stores. The Little Mermaid is very close by as is the Marble Church, Amalienborg, and Rosenburg Castle. Friendly neighborhood away from the bustle of the city center but still enabling easy access to it. The bathroom is good and the beds are very comfy. There is also a lift in the building if this is a necessity. Be aware that a third party manages this property and all communication will be with them. They were helpful, however, in getting us settled in and were waiting at the property when we arrived. This apartment is in a very good location - and that is what you are paying for. It is an easy walk to Nyhavn and many other attractions - or you can hop on a bus which stops very close. The apartment was clean and fresh and the kitchen was well equipped. Getting in to the apartment went very well, I phoned the company from the airport and they were very helpful; we walked from the nearest tube station, and after getting lost a little bit we found that the apartment was only about 10 minutes walk from the metro. I was a bit surprised that we were expected to put our own bedding onto the beds, and that they still have a very old style TV - to be honest - as is is only for watching DVDs is seems hardly worth even having it in the place. As it was very hot while we were in Copenhagen a balcony would have been nice and we found it very warm in the apartment at times - there were strict rules about not leaving windows open while you are out. There were also quite a few rules for when we left (strip the beds, put the towels on the floor, put all the rubbish out etc) but we usually do these things anyway so it was no great issue! It's great to have a lift, even for a 2nd floor apartment, after a day of sightseeing (Although it is quite a small, old lift!). We found supermarkets, bars and restaurants nearby and so it was all very convenient. All in all a good stay - but for the money I would expect it to be of a good standard. It's all about the location! 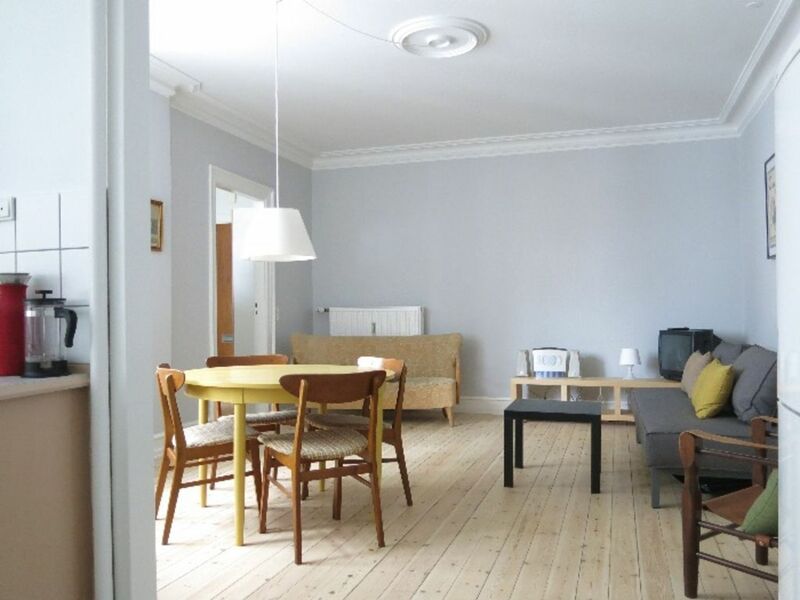 This apartment is in a very good location - an easy walk to Nyhavn and many other attractions - or you can hop on a bus which stops very close. The apartment was clean and fresh and the kitchen was well equipped. The meeting and getting the key went very well - we walked from the nearest tube station, and after getting lost a little bit we found the apartment was only about 10 minutes walk from the metro. I was a bit surprised that we were expected to put our own bedding onto the beds, and that they still have a very old style TV - as is is only for watching DVDs is seems hardly worth even having it in the place. There were also few few rules for when we left (stripping the beds, put the towels on the floor, but all the rubbish out etc) but i think we managed to do everything we were instructed! It's great to have a lift, even if it is only on the 2nd floor, after a day of sightseeing (Although it is quite a small old lift!). We found supermarkets, bars and restaurants nearby and so it was all very convenient. All in all a good stay - but as it was at the higher end of the price bracket for apartments we were looking at we would expect it to be of a good standard.